Paper summary marek They describe a method for augmenting existing word embeddings with knowledge of semantic constraints. The idea is similar to retrofitting by Faruqui et al. (2015), but using additional constraints and a different optimisation function. 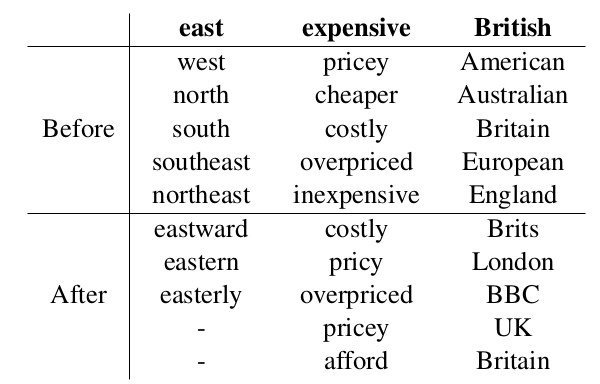 https://i.imgur.com/zedR5FV.png Existing word vectors are further optimised to 1) have high similarity for known synonyms, 2) have low similarity for known antonyms, and 3) have high similarity to words that were highly similar in the original space. They evaluate on SimLex-999, showing state-of-the-art performance. Also, they use the method to improve a dialogue tracking system. Abstract: In this work, we present a novel counter-fitting method which injects antonymy and synonymy constraints into vector space representations in order to improve the vectors' capability for judging semantic similarity. Applying this method to publicly available pre-trained word vectors leads to a new state of the art performance on the SimLex-999 dataset. We also show how the method can be used to tailor the word vector space for the downstream task of dialogue state tracking, resulting in robust improvements across different dialogue domains.